Uschi Reiter: With the Snowden affair the Internet as space for surveillance has reached a wider public. This incident and the excitement it caused hasn’t brought about any major withdrawal from the social network Facebook, for example. What impact does this knowledge of control have on the way we culturally act and communicate on the net? Felix Stalder: As long as there is no real alternative to the ever expanding parts of the Internet, that act as surveillance spaces, the current discussion about the way we should act on the net will remain quite limited. Cryptoparties and such are more symbolic acts. As long as the infrastructure of surveillance is optimised, creating individualised private spheres later will remain a highly complex matter. So it will always be a minority activity. On the other hand, what we can see already is a shift in general assumptions. Extensive surveillance is considered normal, defending yourself against it naive. In the case of legal actions taken against Google’s data mining, Google justified itself recently by saying that Gmail users can’t expect that their e-mails and private information will not read and analysed (“a person has no legitimate expectation of privacy in information he voluntarily turns over to third parties”). Uschi Reiter: Encrypting e-mails and anonymisation services such as Tor is more of practise of geeks. Do you think this practise will spread? Felix Stalder: In mass culture? No. I think that information professionals like journalists, activists and so on will become more careful and pay more attention to the security of services they use. Whereby the issue of security is relative. What resources and methods are used by “attackers” to get hold of the data? Commercial profiling is easier to reduce, because it works with a visible exchange. User-friendliness in exchange for personal data. Whoever is prepared to give up this user-friendliness can easily protect him/herself. It is already sufficient to change default settings, install add-ons, not accept cookies or use a variety of services and so on. However, providers design this exchange in such a way that the loss of usability has a greater effect than a noticeable direct gain of data protection. In practise this means that most users in the end prefer ease. Protection against targeted police surveillance is more difficult, in the case of secret service surveillance impossible. And since Snowden we all know that the latter form of surveillance can affect anyone. Uschi Reiter: Often there is talk about actually wishing for more decentralisation and alternatives in relation to the development of the net. With current requirements for more bandwidth and the fact that Telecoms and Co can’t offer affordable symmetrical connections for households (same bandwidth for up and downloads), real decentralisation was already prevented in the early years of the net when the business with access to the Internet started. Felix Stalder: In order to create a decentralised infrastructure it is not necessary for everyone to become a provider. For the time being, decentralisation is a question of inter-operability. All decentralised Internet services were once inter-operable in the early days, thus making it possible to change providers. Let’s take e-mail for instance, where this is still the case. When I change my provider I can take my address book with me, because e-mail is inter-operable. When I change my social network provider, then I loose my friends because the services are not inter-operable. Behind this lies a conscious decision by developers and investors. If we want to develop in the direction of decentralisation again, we have to increase the requirements of inter-operability. This requires laws, though, so I am not very optimistic that these will come soon. Uschi Reiter: One solution could be running your own “freedom-box” from at home as a communication and production infrastructure. How utopian do you think this idea is, or has that ship already sailed? How do you envisage decentralisation or alternatives? Felix Stalder: Operating relevant infrastructures is a business for professionals. I don’t think it is necessary for everyone to participate in this venture, unless you make it as redundant as BitTorrent did. There it doesn’t matter if one node or provider drops out. What is important, though, is that different providers could engage in competition with one other. It still makes a difference whether an e-mail account is with servus.at or Google, even though with both I expect to be able to access my mails at 3 am in the morning, if I wish to do so. Uschi Reiter: Let’s move away from the mainstream developments of the net for a moment. You just mentioned BitTorrent, which leads me to an other keyword “darknets”. 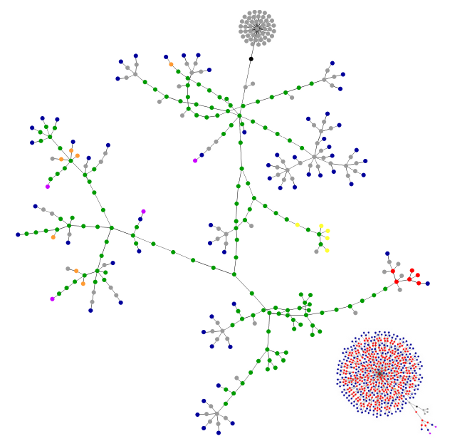 Friend2Friend networks are nothing new. Projects such as RetroShare (http://retroshare.sourceforge.net/), a client that can be installed on any platform ( Windows, Mac, Linux), would actually offer everything that is needed. Encrypted communication, file-sharing, forums between trusted friends and so on. It unfortunately fails because of its very bad interface. Could projects like this take off or develop into a new business model? Felix Stalder: There are a lot of darknets, especially in file-sharing where a lot of communities have gone into hiding and can only be accessed by members. This makes them almost invisible to the outside and the better gated communities make sure that their connections to the outside, through links that point outward, are consistently anonymised. Darknets are a result of the pressures of criminalisation, which is partially justified. The greater the negative consequences of discovering the trade are, the more people are willing to use more complex tools to protect it. I think here we can observe a learning process that enables new business models. This also carries risks, because increasingly the use of encryption is in itself suspicious and can attract increased attention from the authorities. This is very risky for providers of these services as well as for the users, as shown by the voluntary shut-down of encrypted e-mail providers in the last few weeks. This is one of the few reasons why I think it would be sensible to encrypt non-critical communication in order for encrypted communication to not be so conspicuous. The basic assumption about darknets, whose existence I see as positive (in contrast to the darknets of organised crime), is ultimately very problematic: we are in a hostile environment and in it we have to hide our actions that are actually legitimate. This is an experience of dictatorship and not a constitutional state, which we shouldn’t give up just like that! Uschi Reiter: mur.at and servus.at are self-operating data centres for artists and cultural workers in Austria that still stem from the time of “Access for All”. Even though the fundamental ideas have been fulfilled, servus.at is still popular with users and constitutes an important base for democratic processes (e.g. free radios). Servus.at is only able to survive through financial support from its members, meagre funding and a lot of voluntary work. Do you think that communicating socio-political, net-political topics in connection with digital culture has gained more relevance today than actually running a such a structure? Felix Stalder: It would be a very positive effect in this discussion if the value of decentralised and independent infrastructures and their providers could be brought back into general consciousness and, in keeping with this, the willingness to increase its financial support, through donations, contributions or through public subsidies. Communicating net political topics and running a independent infrastructure go hand in hand. Because even with the best communication work, our influence on the giants of the net is very small. Communication work can raise awareness for the value of alternatives, but for that to happen, the alternatives have to exist. In this sense, these are two sides of the same coin. And everyone can choose on which side they would rather work. Uschi Reiter: Digital Natives like to confuse the Internet with Facebook. In the same way that many users can no longer distinguish between browser and desktop. As an initiative for net culture we like to look underneath the surface, but unfortunately this knowledge is increasingly getting lost, because no one seems to be interested in it any more. Wouldn’t this be a good time to introduce something like net culture in schools or does something like that already exist? Felix Stalder: Exactly. Digital natives don’t understand more about digital technologies than non-natives. In actual fact, they understand even less because technology works in a simpler way and therefore it becomes invisible. Tools only catch our attention when they break, as Heidegger already knew. But it is increasingly difficult to look beyond the surface, because technology has rapidly become very complex. This short moment of transparency, when it was enough to press “view source” to understand a website, is definitely over. At the same time are there new initiatives such as HackLabs that try to look beneath the surface. I’m sceptical about the idea of integrating net culture as part of the curriculum in schools, because the likely danger of it turning into a “respect for copyright” event sponsored by industry, is very high. It could be interesting, though, to introduce a DIY and HackLab culture at schools. Whoever is politically interested will gain a better basis to deal with our present time. Uschi Reiter works at servus.at and was a thing.net resident in 1999/2000. Felix Stalder is a lecturer on the theory of media society at the School of Art and Design Zurich, Department for Media Arts. He has been a moderator of the Nettime mailing list, as well as a board member of the Vienna Institute for New Culture Technologies.